Rethymnon, Crete - a guide to a true natural and historical gem of Greece! The prefecture of Rethymnon (Rethymno) is considered by many the most scenic region of Crete, as it boasts an endless variety of natural features, including imposing canyons and gorges, lush vineyards and evergreen forests, sparkling rivers and lakes, long, sandy beaches, and high mountains with impressive caves and caverns. It is the ideal destination for those who want to leave their stressful, everyday lifestyle and be embraced by a serene and relaxing setting. Apart from its amazing natural environment, the Rethymnon Prefecture offers a plethora of archaeological, historical and religious sights that illustrate the significance of Rethymnon in the history of Crete. Just purchase a map of Rethymnon, Crete and set off on a unique adventure! Furthermore, visitors can find an abundance of nightlife venues in Rethymnon Town and popular resorts, such as Plakias, and Agia Galini, Crete, all of which provide exciting evening entertainment. In the charming villages of the prefecture of Rethymnon (Rethymno), there are travenas and restaurants where visitors can enjoy traditional dishes that resemble banquets of luscious delicacies, fit for Roman Emperors. In Rethymnon you have a great number of holiday spots to choose from. If you enjoy a sea view and having the beach at walking distance, we suggest staying at one of the seaside settlements. On the other hand, if you prefer spending a holiday far from the conventional vacation crowds, we recommend a picturesque mountain village. No matter which you choose, rest assured that you will find a wide selection of Rethymnon hotels, studios, apartments, rooms for rent, luxury Rethymnon hotels and vacation villas. The superb tourist infrastructure, including Rethymnon accommodation, Rethymnon rent a car agencies, Rethymnon tour agencies, shops, and entertainment venues, makes the prefecture of Rethymnon a wonderful vacation destination for all seasons. While planning your vacation in Rethymnon, Crete, you can choose the accommodation that best suits your needs and preferences from an extremely wide selection of Rethymnon hotels, apartments, studios, rooms to let and villas. The prefecture of Rethymnon is packed with places of accommodation, satisfying all kinds of tourists, such as family hotels in Rethymnon , apartments, studios and villas for large groups, as well as suites and rooms for couples and smaller groups. Visitors have a choice of Rethymnon hotels by the beachfront settlements with a spectacular sea view, or Rethymnon hotels in charming settings on the lush hillsides. If you prefer staying by the sea, we recommend hotel accommodation in Rethymnon Town, Plakias, Agia Galini, and Damnoni. If you are a nature lover and want to stay in an exquisite natural environment, we suggest Rethymnon hotels in Agia Triada, Perama, and Lefkogia. Many people visit the Rethymnon (Rethymno) Prefecture because of its fabulous beaches and crystal-clear waters. There are Rethymnon beaches of all types on both the northern and the southern coast of the prefecture: some sandy and some pebbly, others long and others short. Many of the Rethymnon beaches are organized, providing sunbeds, umbrellas, water-sport facilities and a number of restaurants and cafes where swimmers can have a delicious meal or a refreshing drink after a day at the beach. On the northern coast of Rethmnon, you can go to the popular beaches near Rethymnon Town, as well as the Rethymnon beaches of Bali, Adele, Platanes and Perivolia or the quieter beaches of Gerani and Episkopi. If you are staying on the southern side of the Rethymnon Prefecture you have a good selection of the much-frequented beaches of Agia Galini, Plakias and of course the beautiful Preveli Beach. For those who prefer secluded and quiet beaches, we suggest visiting the Rethymnon beaches of Agios Pavlos, Triopetra, Damnoni, and Rodakino. Most nightlife venues in the prefecture of Rethymnon are situated in Rethymnon Town, the capital of the prefecture, and the popular tourist resorts of Agia Galini and Plakias, Crete, although no matter where you stay there are always a couple of places to have a drink. Traditional tavernas and restaurants, which can be found practically in every Rethymnon village, serve famous Cretan dishes, such as chochlious (traditionally-cooked snails), dakos (vinegar & water-soaked barley rusk with chopped tomato and feta cheese), apaki (smoked meat), potatoes "oftes" (fried with the peel), rich staka cheese, a variety of seafood dishes and Rethymnon's speciality: "ofto" meat (meat cooked in a ceramic dish). After a scrumptious meal, try kaltsounia (sweet cheese pastries) and finish with a glass of raki, the alcoholic drink that should be sipped, not gulped! Crete is an island that preserves many of its traditions and customs. Some of the festivals and fairs held in the prefecture of Rethymnnon have existed for many years. Rethymnon Town hosts several very interesting events, such as the Mardi Gras Carnival, the Renaissance Festival in July and August, and the Wine Festival in June. In the village of Anogia, Crete visitors can attend the Iakinthia Cultural Festival in the begininning of June and the Anogia Cultural Festival, which takes place August 1-15. Agia Galini hosts a large fair on August 15 honouring the Virgin Mary, while Koxare village holds a 3-day cultural festival in mid-August. Furthermore, the churches in the Rethymnon villages celebrate on the name day of their patron saints with fairs and religious customs. 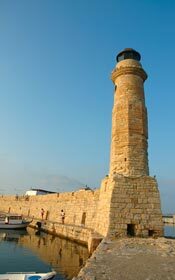 Like the rest of Crete, Rethymnon (Rethymno) has many priceless historical monuments and splendid natural sights. The Venetian Era provided some of the finest historical buildings in the Rethymnon Prefecture. In Rethymnon Town, near Rethymnon Port, you can visit the Venetian Forteza, the Venetian Lotzia and the Rimondi Fountain. Archaeology aficionados will not be disappointed, as the prefecture of Rethymnon has impressive ancient sites, including the Ancient Cities of Lappa, Syvritos and Eleftherna, the Minoan Settlement in Apodoulou and the Minoan Site in Amari. If you are a religious art enthusiast, we suggest visiting the famous Arkadi Monastery and Preveli Monastery, as well as the Monasteries of Asomaton in Amari and Arsaniou in Adele. Throughout the prefecture there are lovely churches and monasteries, many of which contain fine ecclesiastical artwork. For the museum lovers, there are the Archaeological, Folklore, Historical and Ecclesiastical Museums, and the Modern Art Gallery in Rethymnon Town, the Sealife Museum in Agia Galini, and the Wax Museum in Zoniana. Finally, if you are a nature lover, Rethymnon (Rethymno) is the perfect location to explore the great outdoors. Start off with a hike in the Kotsifou, Patsos and Kourtaliotiko Gorges, or a walk on the lush Psiloritis mountainsides. For the amateur speleologists, Rethymnon offers the Ideo Andro Cave in Anogia, where according to legend Zeus was born, as well as the "Sfendoni I Tripa" Cave in Zoniana and the Melidoni Cave, both of which have superb stalactites and stalagmites. The Prefecture of Rethymnon (Rethymno) has a temperate Mediterranean climate, which is quite pleasant throughout the year. Like the rest of the island, the weather in Rethymnon, Crete is hot and dry in the summer and mild but rainy in the winter. In the deep winter months, it may snow in the mountains, but the temperature in the lowlands is moderate. From January to March, the temperature in Rethymnon ranges from 10°C - 17°C. The months of April and May warm up reaching the spring temperatures of 15°C to the low 20's. With summer comes heat and Rethymnon weather though quite warm remains bearable at the low 20s to the low 30s. October temperatures fall to approximately 20°C, while November and December are quite warm considering the time of the year, as temperatures range from 12°C to the low 20s. All of Crete, including the Rethymnon Prefecture, is subjected to strong northerly and southerly winds, which keep the island relatively cool during the hottest months of the year. You can travel to Rethymnon, Crete by ferry boat that departs from Athens ( Pireaus Port). Ferry boats to the Port of Rethymnon (Rethymno) are frequent, especially during the summer and the peak holiday months, when the prefecture is host to thousands of tourists from all over the world. Boat fares to Rethymnon vary, depending on the season and the type of boat. If you choose to come to Crete by airplane, you can take a flight to Chania Airport from Athens Airport and then a bus to Rethymnon. There is frequent bus service from Chania Airport to Rethymnon Town and other popular resorts in the Rethymnon Prefecture. For further information about ferries to Rethymnon, Crete, click here to be directed to our Rethymnon Travel Agencies' page. You may also choose to rent a car at Chania Airport and drive to your destination in Rethymnon, or to rent a car upon your arrival in Rethymnon to tour the prefecture at your leisure. A fabulous way to see the prefecture of Rethymnon is to sign up for a motorbike tour of the finest historical and natural sights in the region. Feel the freedom of the open road and experience Rethymnon to its fullest.